Is it called chicken bone broth or chicken bone stock? What’s the difference between the two? I actually wasn’t sure myself, so I did a bit of research and essentially, bone stock (any bone stock, be it chicken, beef, pork or fish) is made by roasting the bones first, and then adding the water to them, and bone broth is made by simply adding water first. I actually have tried both ways, and while roasting the bones often leads to a deeper, richer flavor, the “water only” way is very nice and tasty as well. 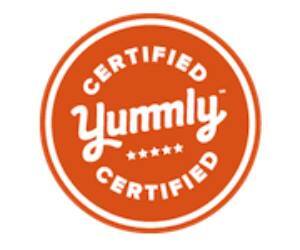 But when we’re talking about terms, why complicate things when the end results are simply delicious? If you remember, last week I did a recipe review on Ina Garten’s Engagement Chicken. (You can read about that here). I mentioned at the bottom of the post that because I don’t like to waste anything, that I would make a stock from the bones. Believe me when I say that this is super tasty and incredibly easy, not to mention very good for you. AND it stretches that grocery dollar! By the way, when you make the Engagement Chicken (was there a proposal after the meal? – Actually who cares if there was or not – A good meal was had and that’s all matters, right!) take the left over chicken and make some chicken broth. The broth is ideal for making all sorts of things that will add extra flavor to other dishes, and of course, will make you the culinary wizard we all know that you are. 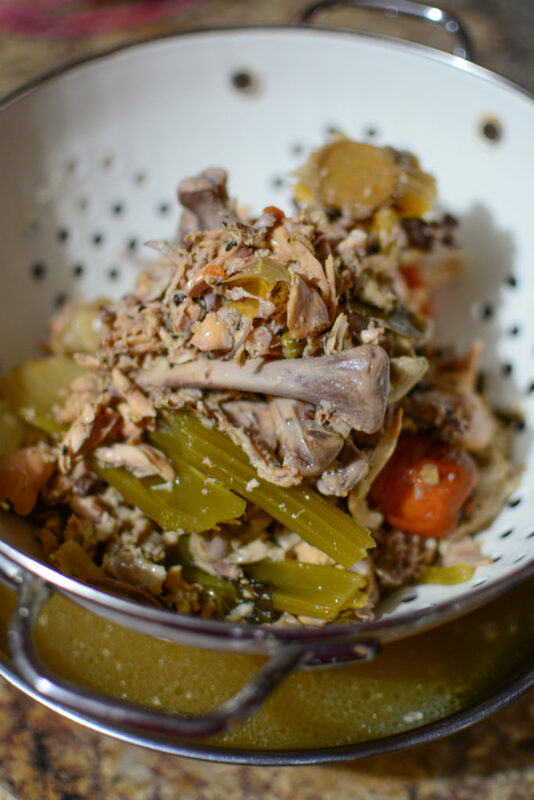 What can you do with Chicken Bone Broth? What are the health benefits to making Bone Broth? I won’t go in-depth with the science here, but bone broth provides us with gelatin/collagen. Collagen is excellent for nourishing our skin, nails and hair. Plus it’s high in protein and there are many trace minerals that are great for your health. There is actually scientific proof that chicken bone broth (not sure about beef or the others), can actually help ward off the common cold. I think that’s so amazing! 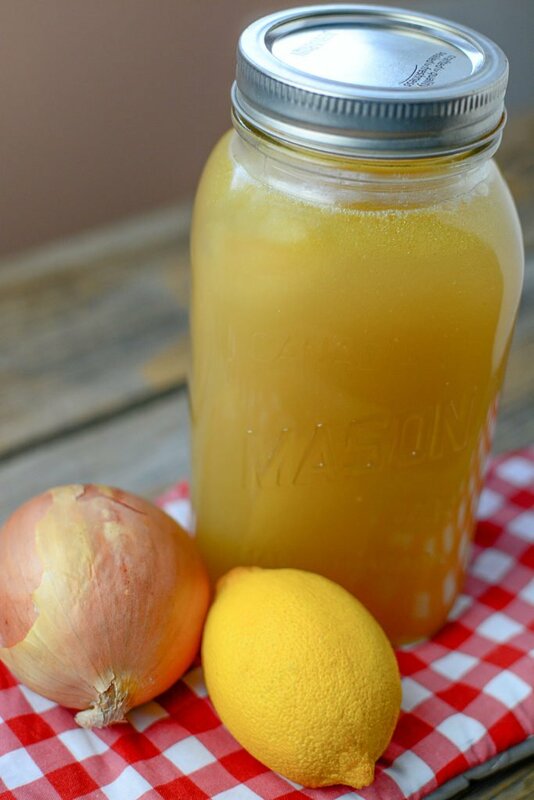 How easy is it to make your own Chicken Bone Broth? Simply take off any large bits of chicken and reserve them for later. Break up the carcass into smaller pieces so that it fits into the a large soup pot. Add enough cold water so that it covers the bones by about an inch. At this point, you can leave it as is, and make a very simple chicken bone broth. While I make it that way sometimes, more often than not, I’ll add whatever vegetables I have in the fridge that might be getting a bit soft. (Do not add vegetables that are mushy or have mold on them.). Carrots, onions, and celery are all wonderful flavor boosters for chicken broth. As you can see, I added some carrot, celery and celery tops, garlic, peppercorns, and a couple dried bay leaves. Let the whole mixture come to a slow simmer, and I prefer to let it simmer stove top for at least 4 – 6 hours MINIMUM. You can leave it up to 24 hours if you prefer! Taste it as it goes and adjust seasonings. When you’re happy with the developed flavor, strain the broth and discard the bones/vegetables. At this point, you can begin to make almost any flavored soup, or freeze it to use some other time. I hope that this post has helped you discover ways to utilize a chicken carcass in ways to nourish your body, and at the same time, stretch your hard-earned grocery dollars. 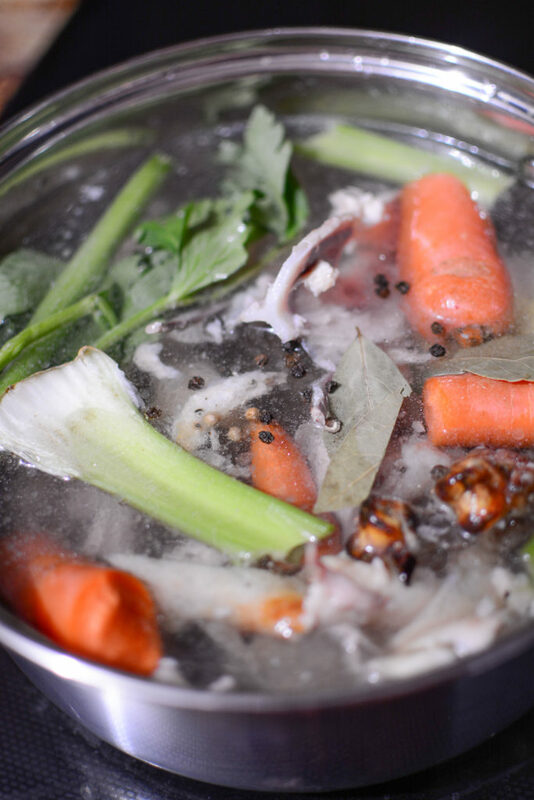 I find that when I make chicken bone broth, I feel good in the idea that I’m furthering my gratitude to my mother and grandmother who taught me how to make it, and as well, to the animal who has contributed to providing nourishment for my body. If you have any questions or comments, please feel free to leave a note below, or contact me on my facebook page and send me a private message! Eva!!! Thank you so much taking your time and writing! Yes.. I am a big believer in using as much as you can and not wasting. I currently have a bag in my freezer that has shrimp tails and shells and when I make a shrimp recipe, I take the shells/tails off and add them to the bag so I can make a seafood broth when I get enough in the bag! Also, I TRY to remember that when peeling carrots or potatoes, or taking the skins off of onions, etc. to save those and add it to the bag in the freezer as well. It adds wonderful flavor if you add it to bones when making broth (or even a vegetarian broth!). Martha Stewart had an episode MANY years ago where she taught how to make a vegetable broth by just adding soft and not so “perfect” vegetables you have in your fridge and pantry. She added full onions, cut in half, skins on and everything. I was shocked! I tried it and it was fantastic! With a little bit of effort, you can stretch your grocery dollar and still eat amazingly well. I love that you save the turkey carcass Eva, that’s so great! I’ll have to check out Emeril’s recipe! I tried another one of his that saute’d Kale and it was incredible! Thanks again for writing in, nice to hear from you!